By Keith Cowing on January 30, 2015 8:50 AM. "NASA's independent safety panel accused the agency of a "lack of transparency" about its program to hire commercial space companies to fly astronauts to the International Space Station, saying the opacity could create increased safety risks. In its annual report to Congress, the Aerospace Safety Advisory Panel said the lack of communication about critical safety measures "has been a concern for a number of years." And it made it impossible for the panel "to offer any informed opinion regarding the adequacy of the certification process or the sufficiency of safety" in what is known as the "commercial crew" program. The "failure to engage in open and transparent communication is reminiscent of the problems" surrounding the causes of the fatal Challenger and Columbia space shuttle disasters, according to the report released Wednesday." By Marc Boucher on January 27, 2015 2:15 PM. "SpaceX has released a new animation depicting the launch of a Falcon Heavy from famed Launch Complex 39A (LC-39A) with the controlled recovery of both boosters and the first stage." Marc's note: From animation to reality in a few years? Yeah, we like that. Why can't other companies do this? By Marc Boucher on January 26, 2015 3:34 PM. "NASA, Boeing and SpaceX will held a news briefing on NASA Television at the agency's Johnson Space Center in Houston on Jan. 26, to highlight key development activities, test plans and objectives for achieving certification of two American crew transportation systems." Marc's note: Missed the news conference? Watch it from the link above. Bolden "I don't ever want to write another check to Roscosmos"
Upshot of CCtCAP presser: SpaceX & Boeing on track for cmrl crew to be ready by 2017. Bolden optimistic Congress will fully fund in FY16. Continue reading First Commercial Crew Test Flights in 2017. By Keith Cowing on January 26, 2015 10:56 AM. "The deadline for the Google Lunar XPRIZE was officially extended until December 31, 2016. As part of this revised timeline, at least one team must provide documentation of a scheduled launch by December 31, 2015 for all teams to move forward in the competition." "These five Milestone teams, with representatives from all over the world, will be gathered in San Francisco on Monday, January 26, for a glitzy awards ceremony." Keith's note: 5 teams were competing for these milestone prizes. The same 5 teams won these milestone prizes. Has there ever actually been any real competition? Continue reading Everyone Wins at Google Lunar X Prize. By Keith Cowing on January 23, 2015 6:45 PM. "The Air Force and SpaceX have reached agreement on a path forward for the Evolved Expendable Launch Vehicle (EELV) program that improves the competitive landscape and achieves mission assurance for national security space launches. Under the agreement, the Air Force will work collaboratively with SpaceX to complete the certification process in an efficient and expedient manner." By Keith Cowing on January 22, 2015 1:50 PM. "Moon Express and Space Florida have signed an agreement that will lead to Moon Express spacecraft development and flight test operations at SLC-36 starting early this year. The agreement allows Moon Express and the state of Florida to make investments into the refurbishment of SLC-36, leading to a revitalized range and the immediate creation of 25-50 new jobs and potentially hundreds of direct and indirect new jobs over the next 5 years." By Marc Boucher on January 20, 2015 8:36 PM. Marc's note: Updating my story from yesterday, SpaceX this evening issued the following statement. "Space Exploration Technologies (SpaceX) has raised a billion dollars in a financing round with two new investors, Google and Fidelity. They join existing investors Founders Fund, Draper Fisher Jurvetson, Valor Equity Partners and Capricorn. Google and Fidelity will collectively own just under 10% of the company. SpaceX designs, manufactures, and launches the world's most advanced rockets and spacecraft. This funding will be used to support continued innovation in the areas of space transport, reusability, and satellite manufacturing." With this new investment, SpaceX is now valued at over $10 billion. A nice way to start the year even if their Autonomous Spaceport Drone Ship suffered some damage from that spectacular crash landing earlier this month by the Falcon 9 first stage recovery attempt. By Keith Cowing on January 20, 2015 4:14 PM. "[HEOMD AA Bill Gerstenmaier]: On August 6, 2014, the Source Evaluation Board (SEB) appointed to evaluate proposals for the Commercial Crew Transportation Capability Contract (CCtCap) under Request for Proposals (RFP) NNK14467515R presented the results of its evaluation to me and other senior officials of the National Aeronautics and Space Administration (NASA). I held a follow-up meeting on August 19th to ask additional questions of the SEB and receive input from my advisors. My decision on selection of the successful Offeror is set forth in this Source Selection Statement." "Sierra Nevada alleges that NASA's evaluation of proposals departed from the RFP's stated criteria, and was unequal and unreasonable. We deny the protest." By Keith Cowing on January 17, 2015 9:50 AM. One lot consisting six 24KT gold plates weighing 6,015.5 grams. These plates were reportedly flown in space for 69 months. Please click on attachment for purity information rounded to the nearest 1/10th determined by x-ray fluorescence. "LDEF's 69 months in space provided scientific data on the long-term effects of space exposure on materials, components and systems that has benefited NASA spacecraft designers to this day." Keith's note: Hmmm ... These plates were reportedly flown in space for 69 months. Sounds like LDEF to me. But "reportedly flown"? Is GSA uncertain whether these things have been flown in space? Can't they just ask NASA? By Keith Cowing on January 16, 2015 8:30 PM. "Musk's series of images also prompted a response from United Launch Alliance president and chief executive Tory Bruno. He noted his company has a number of employees who worked on the DC-X, a 1990s-era project to demonstrate vertical takeoff and landing technology for future reusable launch vehicles. "Let me know if we can help," Bruno wrote." "July 31, 1996 [DC-XA] Landing strut 2 failed to extend; vehicle tipped over and LOX tank exploded; vehicle destroyed." By Marc Boucher on January 16, 2015 9:25 AM. "Elon Musk has released several images through Twitter of what he charaterizes as the "rapid unscheduled disassembly" of the Falcon 9 first stage as it approaches the SpaceX Autonomous Spaceport Drone Ship. The pictures are spectacular." If ppl are saying that @SpaceX Falcon landing/crash pics that @ElonMusk posted are "cool" imagine what the reaction will be when it works! By Keith Cowing on January 14, 2015 11:11 AM. "Znak&Jones, the recently launched production company of veteran reality producers Natalka Znak and Simon Jones, has partnered with the Center for the Advancement of Science in Space the organization selected by NASA to oversee research onboard the International Space Station U.S. National Laboratory with the goal of enhancing the health and well-being of people and the planet to develop programs centered around the ISS." Keith's 13 Jan note: Of course, CASIS makes no mention of this on their website. Really - why bother? Its only a huge facility we all paid $60-100 billion to build. I wonder if the "reality" aspect of this show will portray the dysfunctional relationship that CASIS, NASA HQ, JSC, and other parts of the agency endure as they stumble to use this amazing on-orbit facility. As best as I can determine, no one at NASA knows anything about this. Keith's 14 Jan update: According to Patrick O'Neill, in a response to NASAWatch: "Thanks for the note. At this juncture, while it is accurate to say that CASIS is exploring the possibility of developing content promoting the research opportunities that exist on the ISS U.S. National Laboratory, no deal is in place with a network or cable outlet. Talks are still in the preliminary stages. Should a partnership to showcase the ISS become solidified, CASIS will provide the public with as much detail as possible regarding any content generating project." Summary: Znak&Jones say that they have partnered with CASIS. CASIS says they have no partnership. And no one at NASA knows anything about the Znak&Jones/CASIS thing. 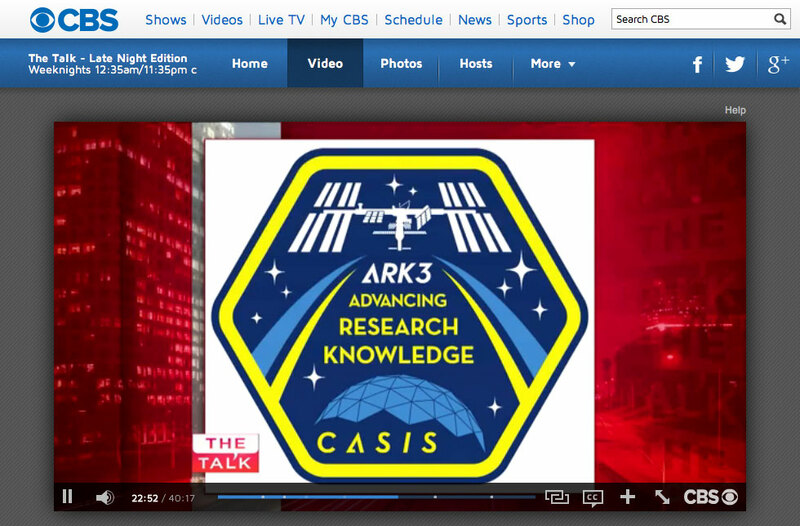 Here is a link to the late Late show episode last night with Seth Green hyping his CASIS patch. Alas, CASIS doesn't seem to want (or know how) to promote the link on its website. Slide to 16:27 and wait for 500 commercials to air. Larger view. CASIS is nowhere close to meeting the fundraising goals it is supposed to have met by now. Instead of focusing all of its efforts on ISS research (Nanoracks is the one good thing that has emerged) CASIS stumbles around with golf company endorsements and PR stunts that, however well-intentioned, never seem to go quite right. And the added value of CASIS is ... ? By Keith Cowing on January 13, 2015 9:47 PM. "The U.S. federal claims court on Tuesday denied a motion by United Launch Alliance, a venture of Boeing Co and Lockheed Martin Corp, seeking dismissal of a lawsuit filed by privately held SpaceX against the U.S. Air Force and the Lockheed-Boeing joint venture. Judge Susan Braden said she was denied the motion because the case was still ongoing, and none of the actions taken by Congress or the Air Force in recent weeks invalidated the SpaceX lawsuit, which challenges the Air Force's decision to award 36 rocket launches to United Launch Alliance." By Marc Boucher on January 11, 2015 2:35 PM. "Today's launch of the SpaceX Falcon 9 to the International Space Station (ISS) on its fifth commercial resupply (CRS-5) was successful. The Dragon spacecraft is safely in orbit heading towards a Monday rendezvous with the ISS. 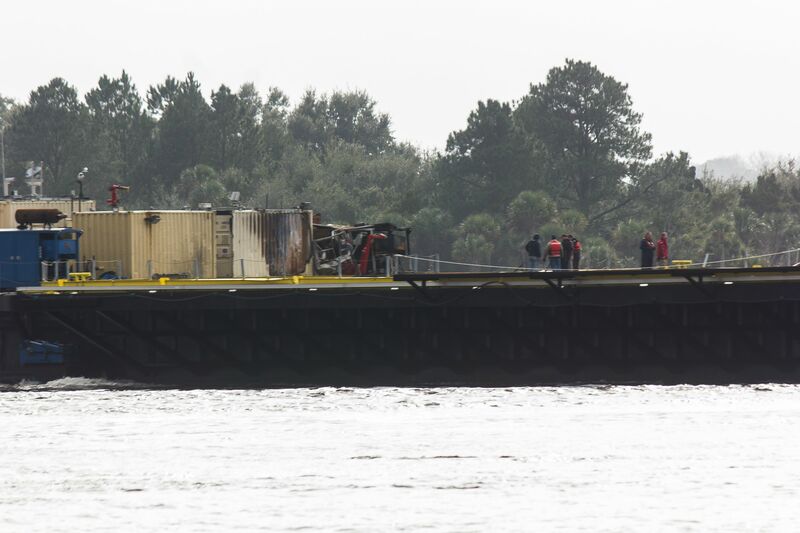 The SpaceX attempt of landing the first stage on the drone ship was not successful." Images of damage to the SpaceX Autonomous Spaceport Drone Ship. Click for larger images. Continue reading Good Falcon 9 Launch - Will Try Again for Drone Ship Landing. By Keith Cowing on January 9, 2015 2:41 PM. "Nissan Motor Co., through its North American-based organization, and NASA today announced the formation of a five-year research and development partnership to advance autonomous vehicle systems and prepare for commercial application of the technology. Researchers from Nissan's U.S. Silicon Valley Research Center and NASA's Ames Research Center at Moffett Field, Calif., will focus on autonomous drive systems, human-machine interface solutions, network-enabled applications, and software analysis and verification, all involving sophisticated hardware and software used in road and space applications." Keith's 8 Jan 8:00 pm ET note: This is rather cool news. Too bad NASA Ames PAO has not posted or released anything about it because who cares, right? Keith's 9 Jan 8:48 am ET update: Stories are online in Italy about this. Nothing online at NASA. Also - it is rather strange that ARC has no link on their event page for the NASA Cube Quest Challenge Summit held at ARC this week. Again, who cares, right? Keith's 9 Jan 2:40 pm ET update: NASA Ames PAO finally posted a short thing on their website - a day after Nissan sent materials out to media outlets. But has ARC PAO sent this out to news media who might want to cover this story? Did they have this material ready the day the event happened? Of course not. By Marc Boucher on January 9, 2015 2:40 PM. "Whitesides told the audience that while the October accident that destroyed SpaceShipTwo and took the life of co-pilot Michael Alsbury was the "the toughest thing we could undergo, nine weeks later, we are turning the corner and looking toward the future - our team and investors remain committed to the goal of opening space for all." By Marc Boucher on January 9, 2015 8:47 AM. "NASA's Kennedy Space Center (KSC) has released its latest Inside KSC video feature. This weeks video takes a look at some of KSC's upcoming missions including the Cargo Resupply mission by SpaceX, the SMAP and DSCOVR launches and the MMS mission." By Marc Boucher on January 6, 2015 6:24 AM. "Launching from Cape Canaveral Air Force Station, Fla. the SpaceX Commercial Resupply Services Flight (CRS-5) will deliver cargo and crew supplies to the International Space Station. It will also carry CATS, a laser instrument to measure clouds and the location and distribution of pollution, dust, smoke, and other particulates in the atmosphere." Keith's note This morning's launch attempt was aborted shortly before launch. Since this was an instantaneous window opportunity there won't be another attempt today. The next attempt will be no earlier than Friday at 5:09 am ET. SpaceX was quietly working an actuator issue last night. No word as to whether is is related to this morning's launch abort although we're heard reports of an "actuator drift" issue in the Falcon's Thrust Vector Control (steering) system during today's countdown attempt. Who Invented The Space Barge? By Keith Cowing on January 5, 2015 8:54 PM. "Blue Origin, LLC ("Blue") filed U.S. Patent Application No. 12/815,306, entitled "Sea Landing of Space Launch Vehicles and Associated Systems and Methods" with a priority date of June 15, 2009 which ultimately issued as U.S. Patent No. 8,678,321 in March of 2014. More popularly known as the Sea Landing Patent, this patent currently covers the broad process of a vertical takeoff rocket taking off on land and vertically landing on a sea-based floating structure. SpaceX has been incrementally and painfully working toward actually pulling this off for several years now and are just now about to attempt the task. To date, no one has attempted, much less accomplished, this feat. If/when SpaceX is successful, the barriers to a mainstream space economy will have demonstrably lowered and yours truly will be one big robotic rocket-powered step closer to lawyering in space." By Keith Cowing on January 5, 2015 4:36 PM. "Years before an unmanned rocket erupted in a fireball in October, NASA officials knew the metal in its 50-year-old Soviet-made engines could crack, causing fuel to leak and ignite, government documents show. As early as 2008, a NASA committee warned about the "substantial" risk of using the decades-old engines, and a fire during a 2011 engine test in Mississippi heightened the agency's concern. The engines had a "fundamental flaw in the materials," said a top manager for NASA's contracted rocket builder, Orbital Sciences, in a 2013 interview with an agency historian. The Soviet engines were built in the 1960s and 1970s in a failed attempt to take cosmonauts to the moon." GAO Rules Against Sierra Nevada Corp.
By Marc Boucher on January 5, 2015 12:06 PM. "On January 5, 2015, the U.S. Government Accountability Office (GAO) denied a protest filed by Sierra Nevada Corp., of Louisville, Colorado, challenging the award of contracts to The Boeing Co., Space Exploration, of Houston, Texas, and to Space Exploration Technologies Corp. (SpaceX), of Hawthorne, California, by the National Aeronautics and Space Administration (NASA) for NASA's Commercial Crew Transportation Capability Contract (CCtCap)." Keith's note NASA PAO has released this statement: "The GAO has notified NASA that it has denied Sierra Nevada Corporation's protest of the Commercial Crew Transportation Capability contract awards. NASA is pleased the GAO's decision allows the agency to move forward and continue working with Boeing and SpaceX on the Launch America initiative that will enable safe and reliable crew transportation to and from the International Space Station on American spacecraft launched from the United States, ending the nation's sole reliance on Russia for such transportation. The case remains under the protective order and blackout until the GAO releases its decision." By Marc Boucher on January 5, 2015 10:01 AM. "Here are some of the highlights for the coming week. As always, you can add an event to our events calendar by using this form. You can also take advantage of low advertising pricing, starting at $75/mth, to further promote your event or product on the SpaceRef network of websites." By Marc Boucher on January 1, 2015 9:57 AM. "Relive SpaceX's 2014 highlights: launching rockets, landing stages, and unveiling our next generation crewed spacecraft." Marc's Note: What are your thoughts in looking back at the year that was for SpaceX in 2014? Good year? Bad year? What you expected? Still the driver in the launch market? And how will 2015 shape up? This page is an archive of entries in the Commercialization category from January 2015. Commercialization: December 2014 is the previous archive. Commercialization: February 2015 is the next archive.